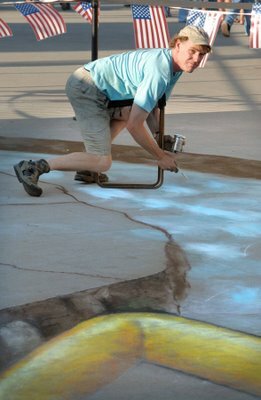 Lately we haven’t heard anything new from Julian Beever and his 3d sidewalk chalk-paintings. But today I found out he has just finished his latest piece of art for Charleston Festival 2007. His masterpieces never stop shocking me with their incredible 3D realism. You have to remember, all of his paintings are anamorphic, and if you look back at from above, or simply from different angle, you’ll see just an ordinary bulged painting. This photo set (more pictures inside the post) is one of my new favorites. Look, he even added a crocodile awaiting his prey. Similar to that lobster motive, or even scarier Eduardor Relero’s drawings. 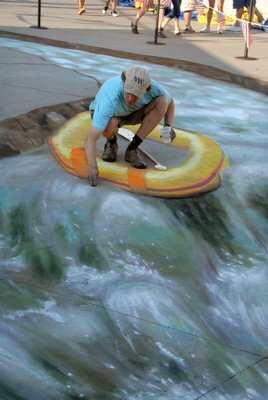 For hundred more of these magnificent chalk drawings, visit 3d Chalk Drawings category! This amazing photo set has been photographed by Rick Lee, who found himself at the right location in perfect time. Great job Lee! I like it. I wish my town had things like that. so amazingly sooper dooper that no words can describe it really. 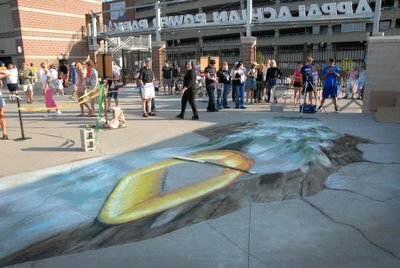 check out the other chalk drawings in the side category! Der kann malen, das glaubt man garnicht! I love these things! They are so cool! I like when they show what the drwing looks like from the side and just how big the drawing is. It’s a great illusion and stuff but i’m starting to get tired of these sidewalk drawings. Put something new up!please! This is a truly talented artist! Great illusion. Wonder how long it takes him to complete each masterpiece? Does it was away when it rains? That is AMAZING! I love how if you look at it from a different angle it looks like nothing at all. Wow! it’s so real for me. I would love to see one of those close. A few months ago I received an e-mail with other amazing works from this guy. He is a real GENIUS!!! I think the first one is the best. Wha the artist did is amazing. With all the details, it looks like 3D. The best part of this all is all the fun the people have poising for the pictures and using their imagination. I too, wish my town had things like that! I have seen this before, and it is truley amazing! They put their talent to good use. I understand that you only get the full efectfrom a certain angle, or the proportions are compleatly off. Keep up the good work! i spy a fly, can u? Wow, if it weren’t for the lines crossing the pictures, I would say that they were real. These sidewalk paintings certainly put Bert the Chimneysweep’s drawings in Mary Poppins to shame! I wonder, does Julian plot out the drawing first on an art package? 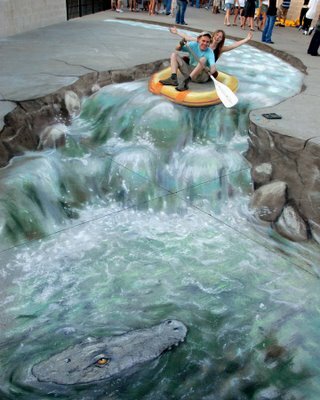 Julian Beever’s artwork is great. I never tire of them. Is there a computer programme that can convert a 2d image into a 3d anamorphic image? I’m sure if somebody made one it would sell well. I’d imagine that anamorphic images would be very popular additions to public events. This guy should go on tour! ( in Australia of course :) ) lol cya! man this is not jus art!! !>< it's like creating another world!! !so inspiring! These are amazing, they must take hours to get right! very smart as a pro illiosionist i say well done!